The mass migration of Muslims into Western societies presents unprecedented opportunities for evangelism. Much of our conversation, however, tends to focus on the challenges Islam brings, and not without reason, for Islam has sometimes been hostile to non-Muslim societies. On account of this history, some have gone so far as to argue that Muslim immigrants should be limited or prohibited from entering Western countries, and those who are already settled should be compelled to assimilate. But there is something missing here, argues Matthew Kaemingk—who teaches theology, ethics, and culture at Fuller Theological Seminary—namely our ethical obligation of hospitality for the immigrant. His Christian Hospitality and Muslim Immigration in an Age of Fear illustrates why and how it should be extended. Christianity is capable of fervently defending those with whom it disagrees. It can speak out on behalf of deep difference. It can be an advocate of generous religious and cultural freedom. It can challenge liberal hegemony, it can contest liberal uniformity, and it can resist liberal assimilation. And it can do all of these things out of an uncompromising belief in the truth of the Christian faith. They insisted that God demanded equal justice for Catholics and Protestants, socialists and liberals, atheists and Jews alike. All ideological communities, no matter how heretical, had to be afforded the freedom to live out their ideological convictions in the public square. Eerdmans (2018). 296 pp. $28.00. In the last 50 years, millions of Muslims have migrated to Europe and North America. Their arrival has ignited a series of fierce public debates on both sides of the Atlantic about religious freedom and tolerance, terrorism and security, gender and race, and much more. How can Christians best respond to this situation? In this book theologian and ethicist Matthew Kaemingk offers a thought-provoking Christian perspective on the growing debates over Muslim presence in the West. Rejecting both fearful nationalism and also romantic multiculturalism, Kaemingk makes the case for a third way—a Christian pluralism that is committed to both the historic Christian faith and also the public rights, dignity, and freedom of Islam. Leading this movement was Abraham Kuyper (1837–1920), whose “theopolitical vision” strove to keep the Netherlands free from the “ideological hegemony of modern liberalism.” The history buff will find this section fascinating. Just as interesting, though, is Kaemingk’s reinterpretation and application of Kuyper’s “vision of Christian pluralism” for the present and into the future. One failure of the Dutch experiment was its assumption that if a “just legal and constitutional structure” protecting public space from ideological hegemony was “established,” the rest would take care of itself. Keamingk recognizes that “a citizenry that actually desires and enacts pluralism in their daily lives and work” is also required. The key in all this, he argues, is making “hospitality . . . the primary frame through which they understand their public and political obligations,” especially with regard to Islam. How American Christians might apply this political theology of pluralism to foster hospitality for Muslims is the focus of the book’s final part. Here’s where Kaemingk’s suggestions become more specific—and much more provocative. This call for a hospitable approach toward Muslims is a helpful corrective to the hostility that can surface in Christians thinking about Muslim populations and the issue of immigration. His argument for a Christian politic of pluralism and advocacy in defense of Islam, however, seems short-sighted and optimistic given the ideological and political nature of traditional Islam. Liberal Muslims themselves (for example, Bassam Tibi, Zuhdi Jassar, Maajid Nawaz, and others) have continually warned the West about this problem. And while this is no excuse for sinful hostility and hatred, it should cause us to think much more deeply about how to resist the ideas of Islam while loving our Muslims neighbors. There is one glaring omission in Christian Hospitality and Muslim Immigration in an Age of Fear. It fails to address the opportunities a pluralistic society presents for speaking the gospel of Jesus Christ to a growing Muslim population. Although Kaemingk explains early on that his book is limited to the concern of Christian ethics, it is interesting that any specific discussion about the evangelization of Muslims is absent. Regardless of where we stand on policy proposals regarding immigration, a Christian is primarily concerned with the ministry of Christ, who died not just for our sins but also the sins of the world. This includes those coming from the Muslim world. While this isn’t the subject of Kaemingk’s book, it’s nevertheless worth the read. It’s comprehensive and well argued. Those from the Reformed (especially the Kuyperian) tradition will find it essential; those outside the tradition will profit too. 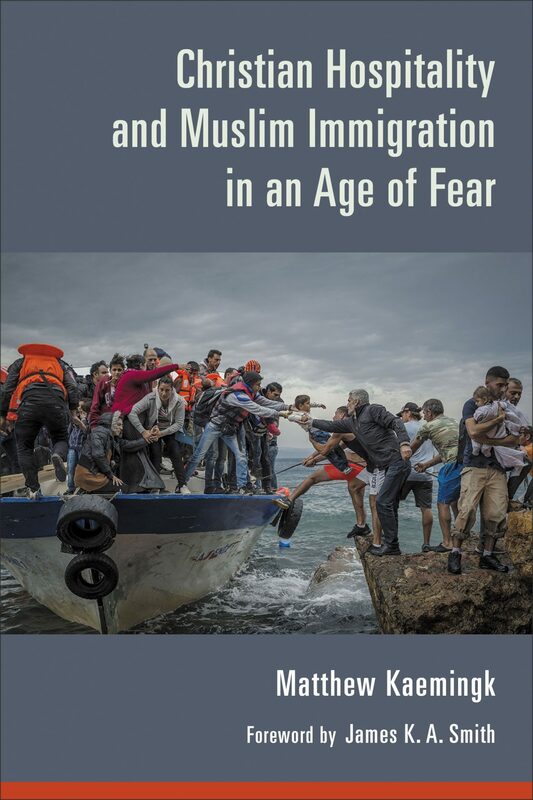 The book marks one of the first and most serious theological attempts to wrestle with Muslim immigration into free societies where Christians will have the opportunity to engage them with hospitality in a culture increasingly hostile to any sort of serious theological commitment.